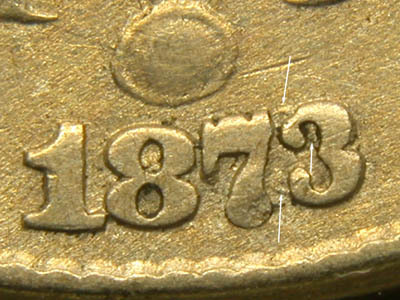 This 1873 (Open 3) is the only large date over small date variety in the shield nickel series. The die was initially punched with a logotype intended for a smaller coin. Inexplicably out of all the shield nickel varieties available, the Dansco folks chose to have a hole in their album for this variety. The variety is quite rare and usually unobtainable; a better choice might have been a representative doubled die obverse..